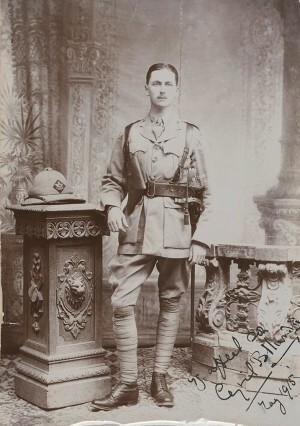 Captain Cyril Stanley Beresford Mundey (c. 1888 – c. 1956) was the son of Major Stanley Mundey and Gwendolen Beresford O’Reilly. He was educated at Eton, which he left in 1906, and at Cambridge, after which he joined the army. He was made second Lieutenant in June 1909; became a Lieutenant in April 1913 and achieved the rank of Captain in June 1915 in the 43rd and 52nd (Oxfordshire and Buckinghamshire) Light Infantry. At the beginning of the War Mundey was gazetted from the special reserves: he remained in India in command of the depot between November 1914 and May 1915. He was attached as an observer to the Royal Flying Corps in September 1915; he was present at the battles of Es Sinn and Ctesiphon; he was besieged in Kut al Almara; and a prisoner of war at Yozgad; he was mentioned in despatches. Mundey had two brothers all of whom joined the army and served in India. Leslie was awarded the Military Cross in France in 1915 and Lionel, who was in the Royal Fusiliers, was killed at the third battle of Krithia in Gallipoli, on 4 June 1915. After the War Cyril Beresford Mundey farmed in Kenya. In 1954 Mundey presented to the Library a significant quantity of the family papers of his wife’s family, the O’Reilly’s of Heath House, Co Laois. This material is mostly from the early nineteenth century with some late-eighteenth-century material. Mundey presented four volumes of his own War writings – two originals diaries of his experiences and two reworked versions. Only the reworked versions are included in this project. Mundey also presented four photograph albums, two of which refer to his army service. There are also some watercolour sketches he made while a prisoner of war.